This information was written early 2010, it demonstrates the forward-thinking nature of our SEOs, please see later articles for up-to-date SEO guides. The process of optimizing web pages is actually quite simple, particularly if you have done a good job of organizing your website and developing your keyword strategy. Remember to plan first, design later. If those two things are in place, then web page optimization should be quick and easy. When optimizing web pages, remember that if you need to bend or break a rule here and there to make sure your pages are easy to use and fun to read, do not concern yourself about it too much. You can always make up for any deviations through the proper use of anchor text. What we will do in this chapter is quickly take you through a web page from top to bottom and indicate where your keyword and key phrase placement will have the greatest impact. Remember, that the algorithms used by search engine are designed to catch the theme and content to provide search engine users with meaningful search results, you are trying to ‘crack’ the formula to ensure you have the best chance of ranking higher in the search engine results pages. We will end this chapter with more information and Guidelines for Search Engine Friendly Webpage Design. The HEAD section of your website is not visible to human visitors of the website with the exception of the TITLE tag which appears in the title bar of your browser window. However, there are many important elements to consider in the HEAD section. Page Title: The page title should contain no more than 10 words and should contain somewhere between 2 to 3 primary keyword phrases as developed in Chapter 5 and nothing else. It serves as a sort of “ad headline” for those who find you in the course of a search so it should be designed to encourage clicks from those who see you in the search results. You might want to note that typically only the first 60 characters in the TITLE will show up on the search result page, so plan accordingly. You should also be aware that the search engines will display the matching keywords in the search in bold. The title in the listing is clickable to the website, so it is important to ensure your primary search terms (keywords and phrases) are in the first 65 characters of the page title. Having those terms in bold will increase the chance of a user clicking on your website. Some people believe that the keywords META tag is unimportant, but we recommend you use it to input some of your primary keywords here. Even better, you might try putting in a few misspellings of keywords if you surmise that your keyword is used incorrectly by search users. Use the first 10 to 12 words to attract visitors to the site being sure to use keywords and phrases. We highly recommend using a different description META Tag for each page of the website. The first 155 characters of the description are included in the search results and influences the click-through rate for your site. You do not need to tell the robots or spiders index or follow because this is their function unless instructed not to do so. The only other META Tag that is particularly important or relevant for SEO purposes is the “verification” tag used by Google Webmaster tools and discussed in Chapter 11: Misc. Information and Summary. Whenever possible, you will want to use core terms, keywords, phrases and their variations in the headings and subheading of each web page. Along with headings, you should be sure to use these search terms in the anchor text of links used throughout the page. 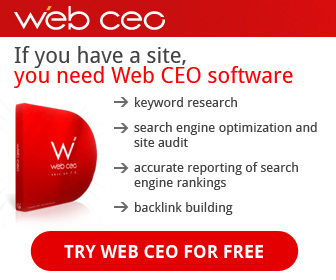 FREE TRIAL WEB CEO – SEO – SEARCH ENGINE OPTIMIZATION SOFTWARE! Web CEO is a top rated SEO software that provides a whole range of Panda Safe Website Optimization Applications that are really helpful to the new SEO.